She said that the impacts from dams to food security in the region would be colossal, as the fisheries in Mekong River, which is the main source of food and income for the people in the region, would largely be diminished. Even though the agricultural sector could get a yield boost in the early years from better irrigation and fewer threats from flood and drought, the lack of sediment influx to downstream agricultural areas would make the soil infertile and reduce the farming yield in the long run, she said. 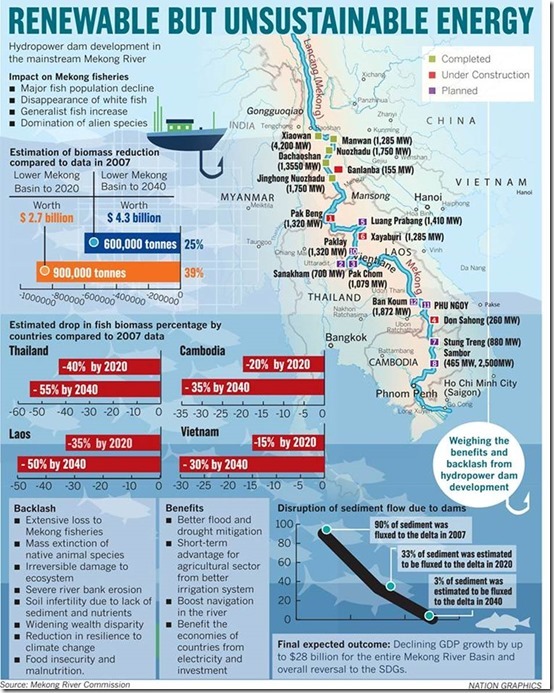 The sediment loss would also result in other costly impacts to Lower Mekong Basin countries, as the research by Sopheap Lim revealed that by 2040 up to 97 per cent would be trapped in the reservoirs of upstream dams and only 3 per cent would reach the delta. From this scenario, the severe erosion at the Mekong River Delta in Vietnam and along the riverbank from Vientiane to Stung Treng in Cambodia will occur, forcing the governments of Mekong countries to invest up to $6.8 billion on riverbank reenforcements. “From these outcomes, the food insecurity and poverty will intensify in the region and the poor people in Laos and Cambodia will be the most affected population in this scenario. These adverse impacts will not only affect the microeconomics, but it will also be felt in the macro scale as well,” Minh said. According to her study, the average of GDP growth potential for Lower Mekong Basin countries can be reduced up to $29 billion, while Thailand would have the greatest economic loss up to $11 billion. Laos and Cambodia would face around $9 billion loss in GDP growth. She added that by including the impacts of climate change to the scenario, the overall impact to the socioeconomy and environment would be more severe and the benefits from hydropower would also be lowered. 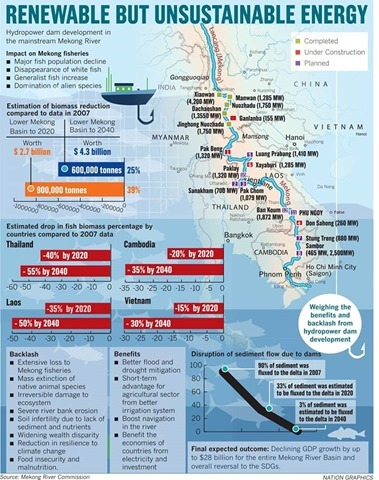 On the impact to the fish population, ecosystem, and biodiversity, So Nam, MRCS Chief Environment Management Officer, said that more than 900,000 tonnes of fish biomass in Mekong River would disappear as a result of impacts from the dams by 2040, which is the equivalent of $4.3 billion. According to So Nam’s research, Thailand would have the highest rate of fish loss as by 2040 as 55 per cent of Thai fish stock will be gone, followed by Laos, Cambodia, and Vietnam at the percentage of 50, 35, and 30 respectively. He further said that due to the change of the river ecosystem from the creation of reservoirs, many parts of Mekong River will transform into lake ecosystem, which is unsuitable for many native aquatic species of the river and will eventually drive them to the edge of extinction. Other species currently alien to the river will flourish and dominate the new ecosystem. He also warned that the hydropower development will further diminish the resilience of the river’s aquatic ecosystems to climate change. However, one of Laotian executive governmental officers on Mekong issues, who asked not be named, dismissed the research findings and said that it was just an estimation. He assured that hydropower dams were crucial to solve poverty and they would provide large amounts of economic benefits to not only Laos, but the whole region. He admitted that the fish and biodiversity of the river were endangered, but he stressed that the impact from dams was only one of the factors. Wastewater from the agricultural sector and cities, overfishing, and climate change all contributed to decrease in fish numbers in the river.